The first blood donation clinics took place in the lower mainland of British Columbia, Canada and has now grown to include clinics across Canada, the USA, Australia and other locations worldwide. The Sikh Blood Donation Campaign has saved more than 120,000 lives till December 2016. 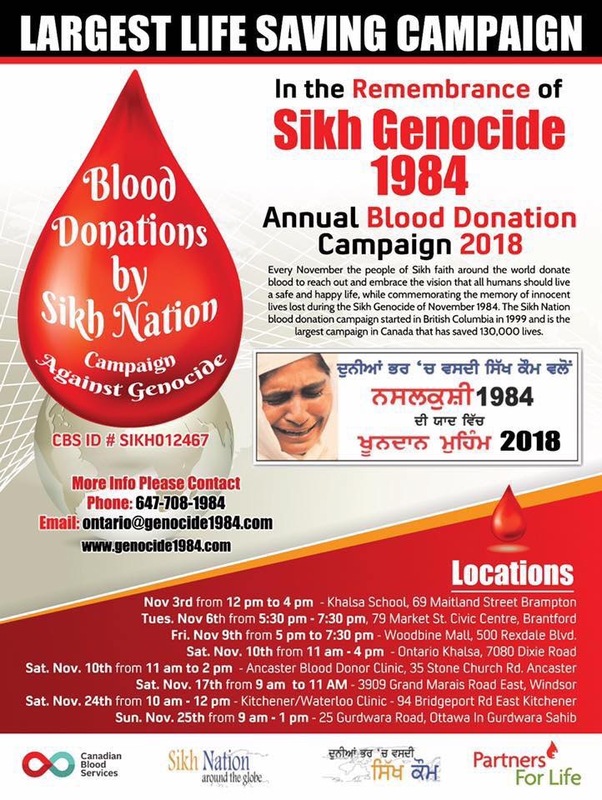 The Blood Donation Campaign is part of an effort to raise awareness of the events of 1984 and at the same time unite humanity. The Sikh Blood Donation Campaign expresses peace and invites people around the world to participate in this humanitarian campaign. and mark your donation by submitting this form online. 2. Go to the Memorial Camps near you. For camp's locations, see Campaign Schedule below. 3. If you lives in Canada, donate on any CBS clinic and sign up online using Partner ID given below. 1. Organize another camp in your city/town/village, please contact. 2. Be a volunteer in your city please contact. 3. Spread the message out. Please Observe One Minute of Silence on Every Year November 1st at 6:00 PM in the memery of the victims of "Genocide 1984"
Copyright © 1999-2011. A Campaign Against Genocide: People's Resolve.